Here on the right side is the home page of my security screen. There is not to much to set in terms of system functionality. There is system time, which is NTP synchronized on startup or whenever you hit the "Get NTP time" button (Connection to Internet is needed :). There are also information about the last system start up time and calculated uptime. Then information about power supply and battery state. 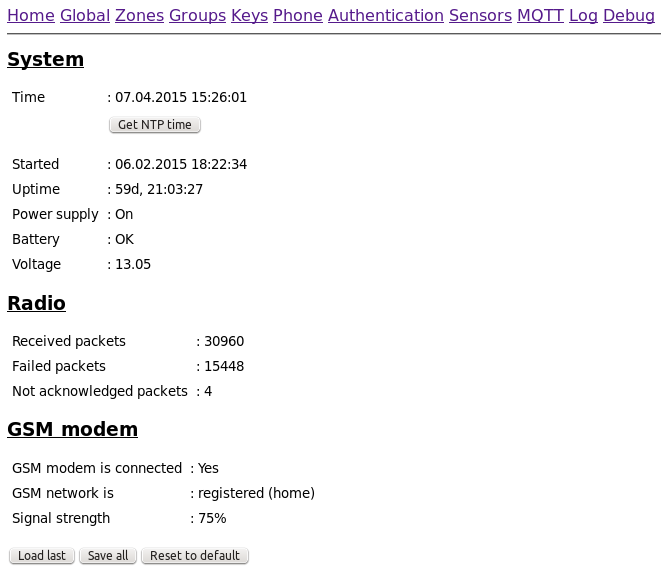 Another section is about radio and GSM module statuses. Rather self-explaining I guess. More important are the last three buttons. Starting from "Reset to default" that will wipe all configuration that is kept in the system RAM and replace it with "factory default". You would do it only in case you really want to start from beginning. The "factory default" must be confirmed by pressing any "Save all" button, so the changes are just loaded into RAM but not stored into EEPROM. You can go and take the last stored configuration in EEPROM by "Load last" button. "Load last" can also be used when you change temporarily any configuration in RAM for test cases. Just remember that in case of power loss the system stores current configuration form RAM to EEPROM just before the main backup battery is depleted.